Thanks to my brain not working I forgot people may not know what a Shofar is (thanks S). Here is the Wikipedia information (with a great photo of one) to give the significance of the item to Rosh Hashana and Yom Kipppur. 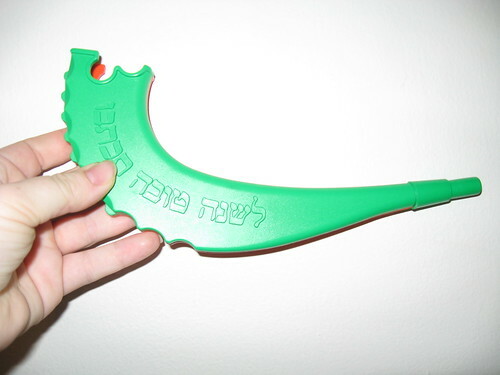 It’s a seemingly harmless plastic shofar for kids. Uncle I and Aunt M had given him one in the past. He loves them, but man can it be LOUD and annoying. So that is the beautiful shofar. Next Saturday evening after Yom Kippur there is a service where I believe there will be at least 6 shofars out in all area of our synagogue. They sound together and it’s an amazing experience.